Russian air monitoring services registered what is tentatively identified as a Ukrainian Su-25 sweeping towards MH-17 on July 17. Russian air monitoring services registered a Ukrainian plane, tentatively a Sukhoi Su-25, sweeping up towards the Malaysian Boeing on July 17, the Russian Defense Ministry said. "The Su-25's distance from the Boeing was three to five kilometers (1.5-3 miles)," Lt. Gen. Andrei Kartapolov, head of the Russian General Staff's Main Operations Department, said at a press briefing on Monday. Lt. Gen. Igor Makushev, chief of the Russian Air Force's Main Staff also said that the new object was spotted in the area where the Boeing crashed at 17:21:35, Moscow time. "This air object was observed steadily by the Ust-Donetsk and Buturino radars over four minutes," the general said. The radars could not identify the plane, "as most likely" it had no secondary identification system, which is characteristic of warplanes," he said. Makushev also announced that the Russian side has a video of the air situation in the area where the Malaysian Boeing crashed between 17:19 Moscow time and 17:25 Moscow time. Three passenger planes, including the Malaysian Boeing, were registered flying during this period along the international air corridor, according to him. Said Kartopolov, the Boeing 777 deviated from its flight path by 14 kilometers and tried to return within the corridor limits before it was shot down. 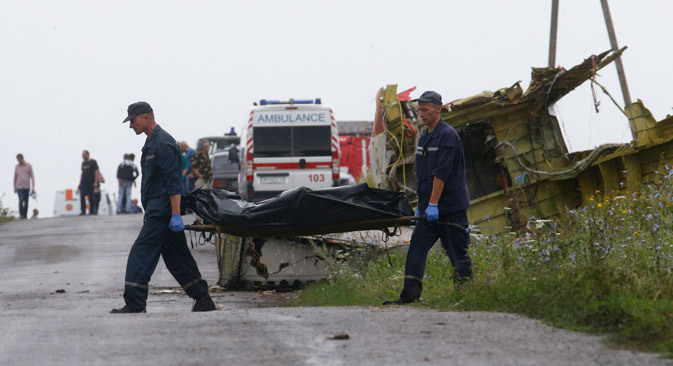 "Before Donetsk, the airplane was flying within the established corridor before deviating northward from the route. The maximum departure from the leftmost boundary of the corridor was 14 kilometers," he said. "Subsequently, the Boeing was observed making a maneuver to return to the limits of the established aerial corridor. The Malaysian crew did not manage to complete the maneuver," Kartopolov said. The deciphering of the flight recorders will help clarify the cause of the Boeing's deviation from the main route, the general said.